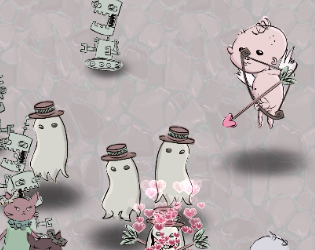 Coupling Cupid: Heart 2 Heart is a Global Game Jam 2013 submission using Unity by a team of 6 people. The theme for 2013 was a sound clip of a heart beating. Originally, the plan involved having a cupid pick good matches, but over time the goal changed. We found it difficult to convey good match information to the player, so we made the game about preventing populations from going extinct instead.